So upon our return Saturday afternoon, I had no choice but to start using strawberries. First I made strawberry-banana pancakes for dinner that night. The next day, I went over to the forty-first Carnival of the recipes at Fresh As A Daisy trying to find more strawberry recipes. Sunday afternoon I made a double batch of strawberry filling from the recipe at Booklore. Monday, I converted some of that into the strawberry turnovers mentioned later in the entry and also used some to make strawberry lemonade. Also on Sunday I made a some strawberry lemon muffins, which tasted great and might have looked fine if I'd put them in paper muffin cups (it's an experimental work-in-progress recipe, so I'm still creating, but edible is always a good start). 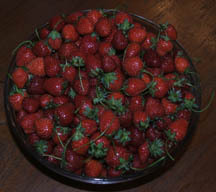 After all that, I still had 6-8 or more cups worth of strawberries left. I picked out the very best, not going mushy at all ones to save for putting on cereal and similar things and froze the rest. If we have enough fresh berries left, which I still need to check, I may make this for dessert tonight. I'm giving a few bags of frozen berries away, but we are well stocked on strawberries for at least a while. Yum. Okay, did I miss something? You didn't take a bunch and dip them in chocolate? I've eaten all the chocolate in the house and was in a hurry to get these things eaten or processed before they all spoiled. Next time I'll plan better for these contigencies and make sure to save some of the chocolate for emergencies like this. My mother in law makes this with "extra" strawberries. I put up two batches of jam last week, and my wife made a strawberry pie. We still had enough leftover for pancakes as well as freezing some. There's nothing like fresh strawberry season. Every year I keep telling myself to go for a second round of picking, but I usually don't make it. Oh well. What? No strawberry ice cream? Strawberry ice cream I can make with the frozen strawberries. But never fear -- that will be forthcoming, as soon as I can make room in the freezer for the bowl of the ice cream freezer.